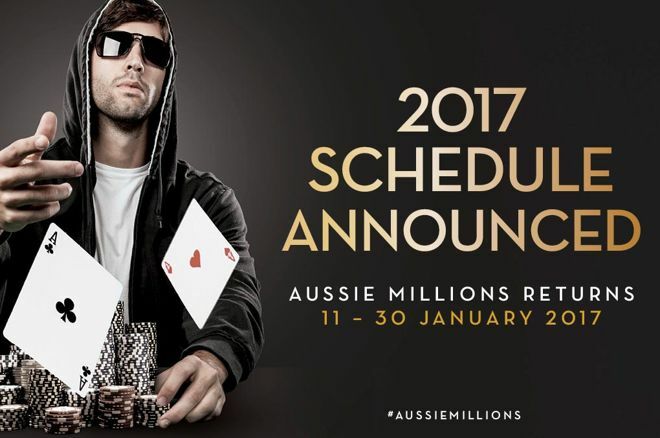 The 2017 Aussie Millions schedule has been announced, taking place Jan. 11-30. The 2017 Aussie Millions schedule has been announced. The Asia-Pacific region's richest and most prestigious poker festival will take place Jan. 11-30 at Crown Casino in Melbourne, Australia, featuring 26 events that span a variety of buy-ins and variants. "Crown's Aussie Millions Poker Championship continues to absolutely stamp itself on the global 'must-attend' list for both recreational players and seasoned pros alike," said Joel Williams, Crown Melbourne's tournament director. "With a schedule now featuring 26 official championship events, 2017 looms as one of the biggest years yet." Returning to the schedule for 2017 are the four premier events of the AU$10,600 Main Event, the AU$25,000 Challenge, the AU$100,000 Challenge, and the AU$250,000 Challenge. The Main Event, which attracted 732 entries in 2016 and saw Ari Engel defeat Tony Dunst to win the AU$1.6 million first-place prize, has been scheduled for Jan. 22-29. The Main Event will feature three starting flights, one each on Jan. 22-24, and there will be a day off on Jan. 28 before the final table is played on Jan. 29. The AU$25,000 Challenge will run Jan. 20-21, the AU$100,000 Challenge will run Jan. 22-23 with the final table on Jan. 28, and the AU$250,000 Challenge will run Jan. 29-30. Click here to view the complete 2017 Aussie Millions Poker Championship schedule. The festival will kick off on Wednesday, Jan. 11 with the AU$1,150 Opening Event. This tournament boasts a big AU$1 million guaranteed prize pool and will have four starting flights across Jan. 11-14. Outside of the ever-popular no-limit hold'em variant, there are scheduled events in H.O.R.S.E., pot-limit Omaha, 8-game mixed, and pot-limit Omaha hi-low to help satisfy poker players of all types. The AU$2,500 H.O.R.S.E. event will take place on Jan. 12, and the first Omaha event, the AU$1,150 Pot-Limit Omaha, will take place on Jan. 16. The AU$2,500 8-Game Mixed event will be held on Jan. 18, and the AU$1,150 Pot-Limit Omaha Hi-Low will take place on Jan. 25. On the final day of the festival, Jan. 30, there will be a AU$5,000 Pot-Limit Omaha event, too. For complete festival information, please head to AussieMillions.com.